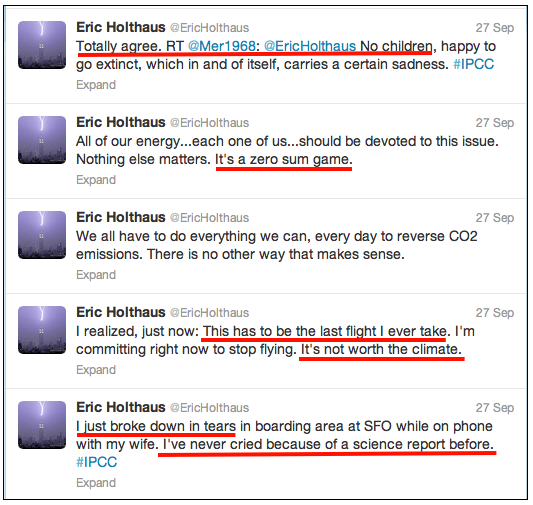 Whether the ice caps are melting and by how much may be debatable, but the debate is over as to whether former Wall Street Journal weatherman Eric Holthaus, who now works at Quartz (qz.com), has had a meltdown. But of course, Eric. They’re trying to set themselves up to be relevant forever. Holthaus, perhaps after a talk with Ms. Holthaus, has walked back his retweet on having no kids: “Despite what the HuffPost wrote, we haven’t yet decided not to have kids. That’s an incredibly personal decision.” Actually, good buddy, that’s what you retweeted. Ducking, diving, bobbing and weaving are the general themes of the Summary for Policymakers, just released this morning. … The general theme of obscurantism runs across the document. Whereas in previous years the temperature records have been shown unadulterated, now we have presentation of a single figure for each decade; surely an attempt to mislead rather than inform. And the pause is only addressed with handwaving arguments and vague allusions to ocean heat. From the questions asked by journalists at the press conference, few cared about the science and the contradictions in what they were being told. The press corps are, almost to a man (and woman) environmentalists and only interesting in decarbonisation. The exceptions were David Rose and the guy from the Economist. So it is very uncertain that the problems in the WGI report will make the mainstream of public discourse. … They’re still misleading the public. Everyone knows (well, many of us know) their models can’t simulate the natural processes that cause surface temperatures to warm over multidecadal timeframes, yet they insist on continuing this myth. Diagnosis: paradigm paralysis, caused by motivated reasoning, oversimplification, and consensus seeking; worsened and made permanent by a vicious positive feedback effect at the climate science-policy interface. … Well, IPCC has thrown down the gauntlet – if the pause continues beyond 15 years (well it already has), they are toast.